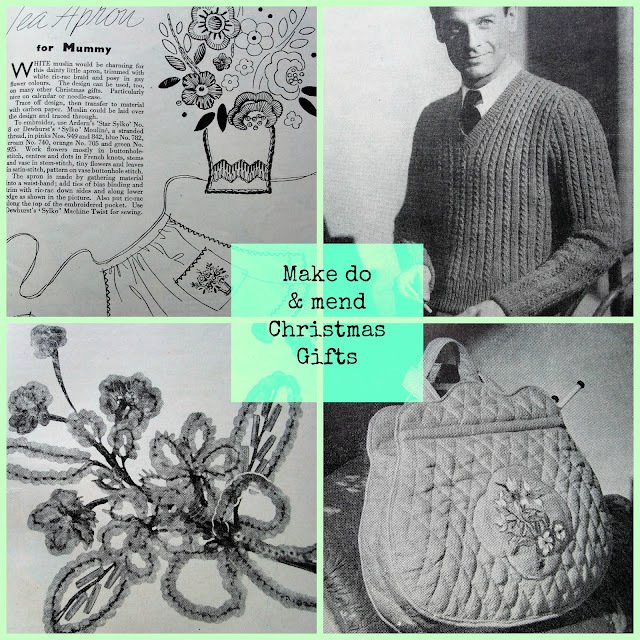 My all time favourite vintage sewing magazines are the Needlework Illustrated magazines from the 40s to 50s. I have been collecting these for a few years now and my collection is coming along nicely. I often will buy job lots of the magazine on ebay if that lot contains a particular issue I am missing from the bookshelves!! That's why I often list my "spares" for sale. Of course, these are perfect examples of the continuing make do and mend trend and often use bits and pieces to create lovely gifts. And of course little girls were expected to learn to sew and these magazines have a children's sewing page - this issue features an apron to sew for Mummy. Also patterns for the obligatory knitted sweater for Dad and knitting bag for the female members of the family. There is a great feature in this magazine showing some fashion jewellery to make. As well as the sequin floral spray above (sequins are threaded onto wire for the outline of each leaf and petal), there is a necklace made from folded squares of plastic! I am always surprised at the bright colours used in vintage sewing projects. Some TV set & props designers would have us believe that the 1920s through 1940s were a dull old time of drab shades. But just look at these lovely little gifts including a darling doll on a swing and little dog in his basket and see how the coloured felts and wools just pop with Christmas joy. And of course, the essential spill holder to light those stoves and fires! In spite of the shortages, it was every 1940's fashionista's desire to look stylish. Even if she had to stitch and knit everything herself in the absence of easily available ready to wear. Isn't this elegant lacy top made up of small crochet motifs the epitome of elegance? And just look at the detail on the bodice front of this dress, very Vera Wang. Evidently this gorgeous brightly coloured floral embroidery design was inspired by an arrangement of flowers in the window display in an antique store! Even though these original magazines are often missing their original embroidery transfers, you can successfully recreate the design if you carefully trace the outline and then use a transfer pen to print it onto your textile. I hope that this look through a vintage 1940s needlework magazine has inspired you to make some of your own Christmas gifts this year. I would love to hear what projects you are working on.